This weekend Juliens Auctions hosted its 2016 Music Icons Auction. Among the many collectibles to be sold were Stevie Ray Vaughan’s “Jimbo” Broadcaster, Elvis Presley’s Ebony Dove, a gift from his father, as well as Kurt Cobain’s smashed Hi-Flier and David Bowie’s custom chrome Steinberger. Separately, Johnny Ramone’s personal and stage-used white Hamer guitar was auctioned to his widow by RR Auctions. This is Stevie Ray Vaughan’s first professional electric guitar, named “Jimbo,” and the guitar that he used to make his first studio and live recordings. SRV first picked up a guitar at age seven and developed his skills using a series of beater acoustic and hollow-body electric guitars before brother Jimmie handed him this 1951 Fender Broadcaster, serial number 0964, in 1966. Jimmie carved "Jimbo," on the back and SRV then scratched his name on the headstock. This may be one of the most important guitars in Stevie's development. This guitar has hung in the GRAMMY Museum alongside SRV’s "Number One" Stratocaster and is believed to be one of only two of his primary stage guitars to go on the market in the past 25 years. It was expected to sell for between $400,000 and $600,000 at auction by Julien’s Auctions Music Icons. Kurt Cobain’s Univox Hi-Flier guitar was played and destroyed at Nirvana’s July 13, 1989 concert at Maxwell’s in Hoboken, New Jersey. After the show, Cobain gave the guitar to Janet Billig Rich, a record executive, and the band stayed at her home. 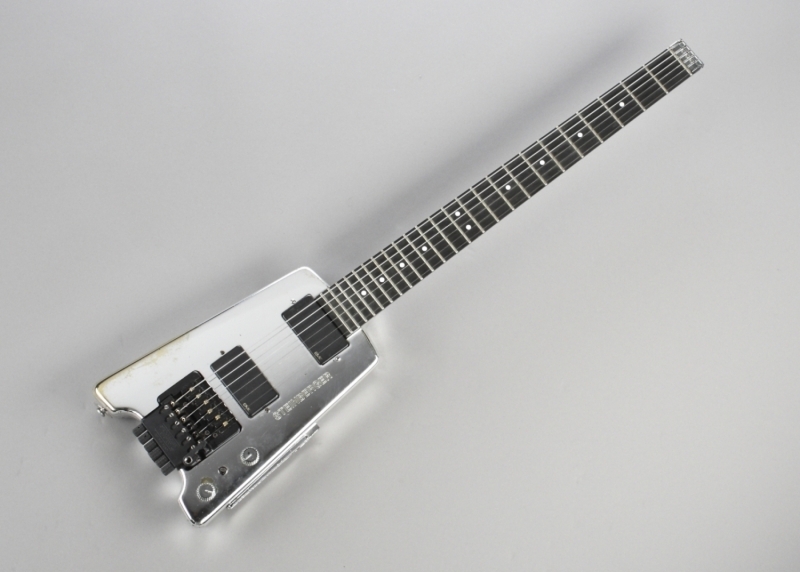 David Bowie’s custom chrome Steinberger L-series guitar, serial number 7712, was used on the Tin Machine records and tour. It was one of two custom chrome-finished guitars created by Ned Steinberger. The first had a silver Mylar covering used to completely cover the neck, frets and body that made the guitar virtually unplayable. Bowie used it for one televised performance and donated it to the Hard Rock Café in Shanghai, China. Bowie liked the look of the guitar however and requested his own from Steinberger without the Mylar-covered fretboard. Bowie used the guitar for the 1991-1992 Tin Machine tour and during the recording sessions for the 1991 album Tin Machine II. The Music Icons auction also included more than 100 items from the life and career of Elvis Presley, including his most well-known guitar, his Gibson Ebony Dove, which was a gift from his father Vernon Presley. During a show in July of ‘75 in Asheville, NC, during the first song, Elvis walked over to the front row and handed the Ebony Dove to a man in the front row. The estimated value was between $200,000 and $300,000. Elvis Presley’s Gibson Ebony Dove, The King’s most heavily played stage guitar, did not meet the minimum bid at auction last night and will be returned to the seller. 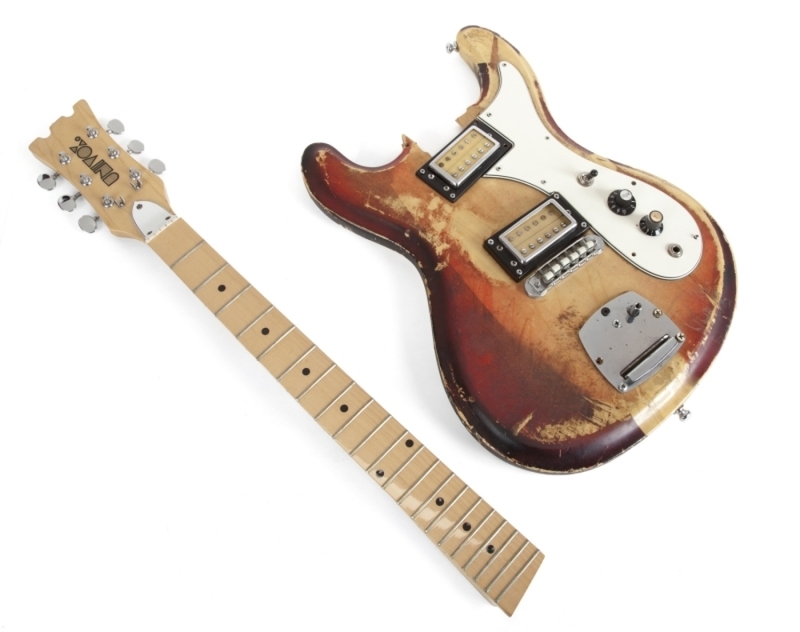 Separately, Johnny Ramone’s personal and stage-used white Hamer guitar, serial number 0185, and signed and inscribed with “To Adam, Johnny Ramone,” was auctioned for $55,247.50 to his widow by RR Auctions. 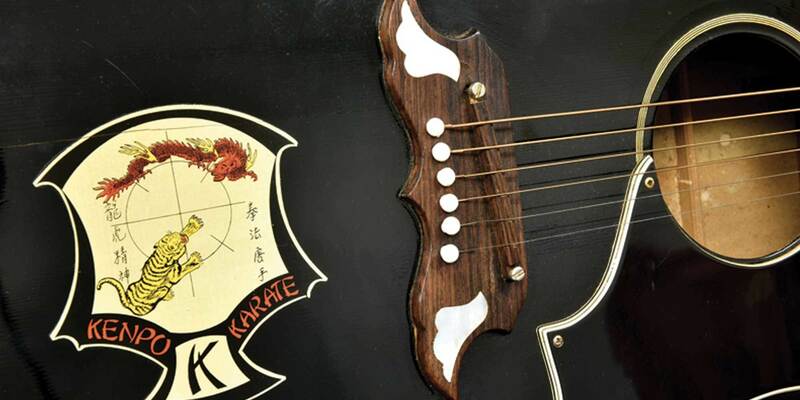 This “special” lightweight Hamer guitar was designed to Ramone’s specific needs. Its original bridge humbucker was replaced with a single coil installed on a cream-colored mounting plate and the original Kluson tuners were replaced with Schallers. The serial number suggests that this guitar was subcontracted by one of Hamer’s ex-partners, as no matching four-digit code exists in the factory logs. According to Jol Dantzig, Lamy and Hamer guitars founder, this guitar represents the first endorsed by any of the Ramones.